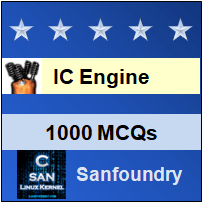 This set of IC Engines Multiple Choice Questions & Answers (MCQs) focuses on “Nozzle”. 1. _____________ is that part of an injector through which the liquid fuel is sprayed into the combustion chamber. Explanation: Nozzle is that part of an injector through which the liquid fuel is sprayed into the combustion chamber while governor is a part used inside engine. 2. _____________ is the first phase in obtaining proper mixing of the fuel and air in the combustion chamber. Explanation: Atomization is the first phase in obtaining proper mixing of the fuel and air in the combustion chamber whereas vaporization is the escaping of liquid. 3. _____________ the injection pressure better the dispersion and penetration of the fuel into all the desired locations in combustion chamber. 4. If the density of compressed air in the combustion chamber is ____________ then the resistance to the movement of the droplets is higher. Explanation: When the density of compressed air in the combustion chamber is high then the resistance to the movement of the droplets is higher and dispersion of the fuel is better. 5. Fuel striking the walls of combustion chamber, decomposes and produces _____________ deposits. Explanation: When the fuel strikes the walls of combustion chamber, decomposes and produces carbon deposits as it can only be decomposed in carbon and not in iron and ashes. 6. ___________ nozzle is used in open combustion chambers. Explanation: The circumferential hole nozzle is used in open type combustion chambers and single or mutli hole nozzle are not used. Explanation: The size of the hole in a single hole nozzle is usually less than 0.2 mm for better sprinkling of fuel. Explanation: The spray cone angle is usually in the range of 50 to 150 in a single hole nozzle. Explanation: The number of holes in a multi-hole nozzle, lies between 4 to 18 depending on the size and requirement of the engine. Explanation: The hole diameter in a multi-hole nozzle, lies between the range of 0.25 to 0.35 mm for better fuel flow in the combustion chamber. Explanation: The the hole angle in a multi-hole nozzle, lies between 200 to 450 for better fuel combustion.